NEW DELHI (Reuters) - Narendra Modi took decisive action as chief minister of Gujarat to secure round-the-clock supplies of electricity. Now, as prime minister of India, he is under attack for failing to avert a national power crisis. More than half of India's thermal power stations have less than a week's supply of fuel - the lowest levels since mid-2012 when hundreds of millions of people were cut off in one of the world's worst blackouts. Coal stocks at thermal stations have hit critical levels as payment disputes escalate, unleashing power cuts that could choke off an economic recovery before it takes hold and hurt Modi's prospects at forthcoming state elections. Financial metropolis Mumbai was plunged into darkness for most of Tuesday, amid a row between private generators and regional distributors that is symptomatic of an industry mired in debt and arrears of at least $100 billion. 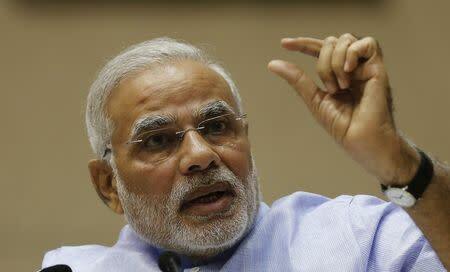 It's a headache for Modi that experts say will only get worse. His government is resisting political pressure for a bailout, just two years after a rescue by the last government that it denounces as a "farce". "The moment I start with financial assistance for one state, all the states will be asking me," Power and Coal Minister Piyush Goyal told reporters on Wednesday as he marked a rocky first 100 days in the job. "States have to improve their own systems. I can't fund their coal purchases," said Goyal, who is mediating in payment disputes in an attempt to mitigate the power crisis. Prithviraj Chavan, chief minister of Maharashtra, has from Mumbai pointed the finger of blame at Modi, who won election by a landslide in May with promises of economic reforms, new jobs and dynamic growth. "The centre is responsible," said Chavan, a leader of the opposition Congress party. He added that he urged Modi two weeks ago to call crisis talks on the power industry, but says New Delhi "has not taken serious note". Maharashtra is one of several states that are at odds with New Delhi on power and coal supplies, and will soon hold elections. Modi's nationalist party hopes to boost its strength in the upper house of parliament, where it lacks a majority. Since Modi took power, coal stocks at thermal power stations that generate three-fifths of India's power have nearly halved to just six days' cover. Of 100 plants, 56 are now 'critical' with less than a week's supply. The shortages have arisen not because India lacks coal - it has reserves of 61 billion tonnes. Nor does India consume much power: per capita use is one-seventeenth of the U.S. level, and 400 million Indians have no electricity at all. What India does have is a mismatch between the regulated price at which power is sold and the cost of producing it, which is typically 20-30 percent higher. As a result, the power sector is caught in a debt trap, leaving generators unable to scrape together the cash to buy fuel from Coal India, a state behemoth that successive governments have shied away from restructuring. "We have a bizarre situation where there is demand for power from distributors without the ability to purchase. Generating capacity is stuck without a contract or the fuel," said Debasish Mishra, a senior director and energy expert at Deloitte. The situation "might precipitate quite fast into a crisis," said Mishra, urging the opening up of coal production to competition and amending power tariffs to properly take into account the cost of fuel. Modi tackled a similar power crisis in 2005 as premier of Gujarat - with a population the size of Britain - with measures that experts say would work in India today. His state government assumed existing power company debts, freed the firms of populist pressures that kept power tariffs artificially low and clamped down on rampant electricity theft. As a result, Gujarat is now a surplus power producer. Doing the same at a national level would, however, be tough as responsibility for power is shared between the 'centre' and India's 29 federal states. The problem is a lot bigger too. The industry has racked up bank debts of 5 trillion rupees ($84 billion), according to central bank figures. Debts owed by distributors totalled $18 billion in 2012, the year of the last rescue. Coal India's receivables are $1.4 billion. Worse, the World Bank estimates that annual losses in the Indian power sector could rise to $27 billion by 2017 without action to tackle wasteful subsidies, power theft and political meddling.